Dollar Tree acquired 138 Deals store locations on March 29, 2006. Since then, the chain has grown to 222 store locations across 19 states. 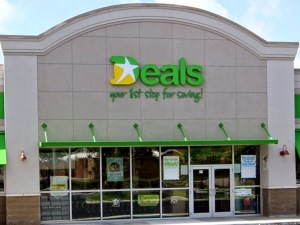 The Deals stores have served customers by offering low prices on everyday essentials, party, seasonal and home products in a multi-price point environment. On July 6, 2015, Dollar Tree completed its acquisition of more than 8,200 Family Dollar stores across 46 states. The company said it expects the Deals store conversions to be completed by the end of July 2016. Additionally, the company said it remains committed to its initiative to re-banner hundreds of Family Dollar stores to Dollar Tree stores. Dollar Tree is on track to complete at least 150 Family Dollar-to-Dollar Tree conversions by the end of October 2015, and plans more of these conversions for 2016. Chesapeake, Va.-based Dollar Tree now operates more than 13,864 stores across 48 states and five Canadian provinces. Stores currently operate under the brands of Dollar Tree, Family Dollar, Dollar Tree Canada and Deals.